Hair curls are the best hairstyles suitable for special events like a wedding. There are different ways to create curls in your hair and one of the simple method is achieving semi-cascading curls that can give really an amazing look for anyone with medium to long looking hair. The curls can be created with any type of curling iron, but make sure to style it in the following ways to get the cascading look. Those who have a lengthy hair, they can just create the curls in their hair with the help of curling irons. 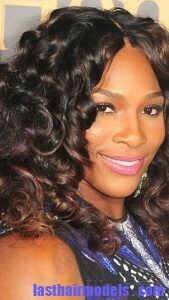 As usual create sections in your hair and use the curling iron on each of these sections to create the curls. Then you can style the normal hair curls into semi-cascading curls. To start first you have to take the hair that in front of your head and secure it in place near the crown. You can just use small hair pins to secure this part of hair on your crown. Then pin some of your hair curls towards the top of your head which will add more elegance to your hairstyle. At last add a tiara over the secured curls over the head and make your remaining hair curls to cascade over the shoulders. You can also mist the curls with a hairspray to keep it shape for a longer time. Instead of curling iron, try to use rollers over your hair to create the curls.